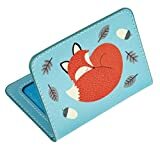 Perfect for traveling, this cute Rusty the Fox card holder in a presentation box makes a great gift! Card holder measures: 10cm x 7cm. Space for 2 cards (transparent window). This entry was posted in Luggage and tagged Card, Choice, Design, Holders, Rusty, travel by Perfect Vacation. Bookmark the permalink.